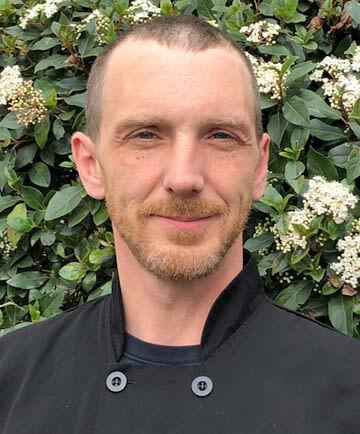 On February 1, 2018 Solvang welcomed TIM GREEN joining us as our Food Service Manager. Born and raised in Chicago, Tim comes from Montana, settling into life in Eugene with his two children, a son, 17, and a daughter, 13. Tim has a cumulative history in cooking that spans 20 years, beginning as a short order cook when he was a teenager. He is a graduate of the International Art Institute in Denver, CO, where he earned, along with his degree, a special certificate in nutrition. His favorite item to prepare is seafood (because that’s what he likes to eat! ), and as no surprise, when he is not working, his hobbies include fishing and hiking. Everyone is responding well to his daily specials and his style of food preparation, especially the ‘from scratch’ soups he makes every day. We look forward to his creative touch with our big events, especially ‘Taste of Solvang’ in November. At 11:30 pm on Tuesday, September 5th the night man on duty at Solvang awakened me. I found two firemen hurriedly moving supplies out of my pantry. I was told that my water heater was leaking and my floor was flooded. Very soon Greg Buzzy, our director, and Ed Deitz, or maintenance man, arrived. They also found a resident's apartment on the first floor just under my apartment was flooded. ... Greg and Ed stayed until they made sure both of us were cared for. I am pleased and impressed with the efficient way this mishap was resolved. I feel very safe and cared for by all of the Solvang staff. Thanks to each and every one of them.